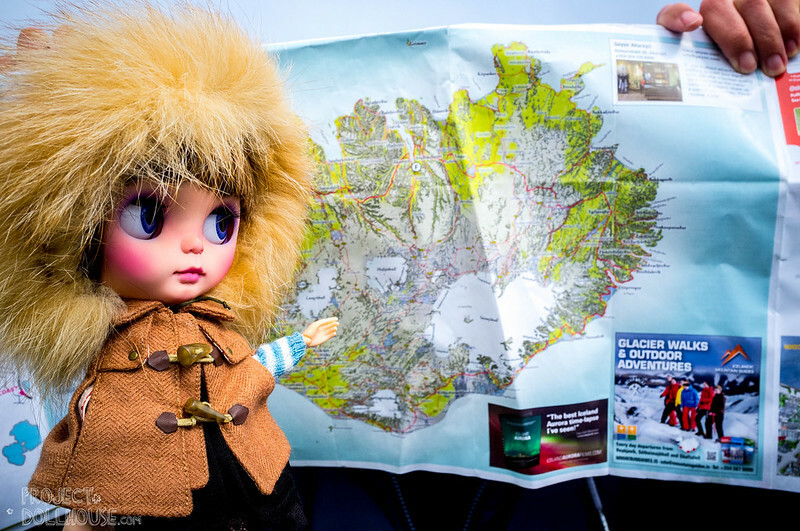 Nori with the assistance of my husband introducing us to Iceland. 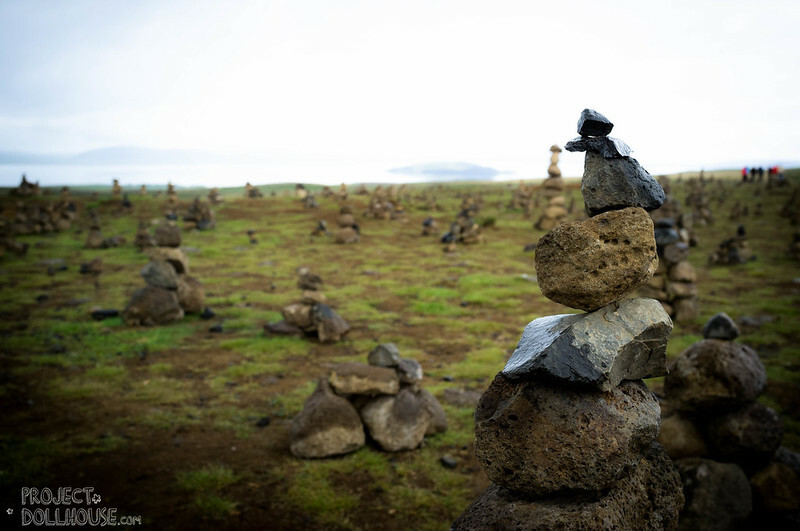 Last week, we touched down in the fantastical land of Iceland. By this, I mean we flew into the summer of no sunsets, through layers of clouds to touch upon this green island with steaming geysirs and powdery green slopes filled with purple, yellow and blue flowers. The first day was super-confusing as we flew from London. The sun didn’t set so the body clock was out of wack, we drew the curtains as much as we could and knuckled down for some forced sleep. 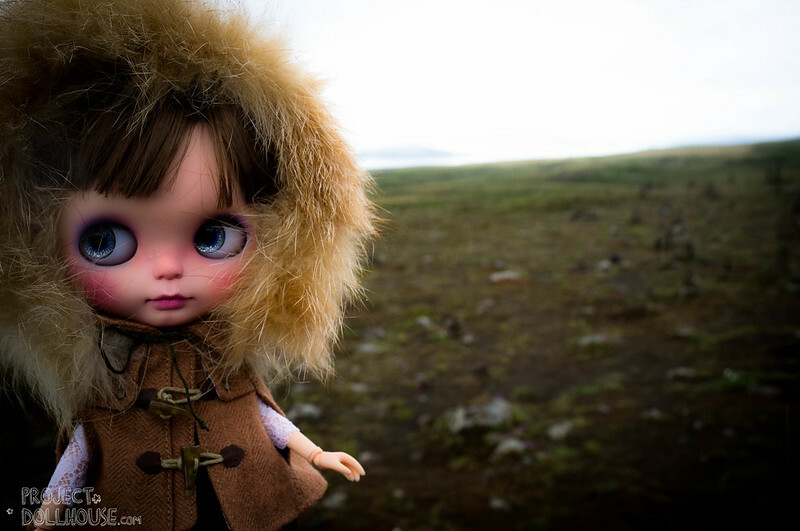 Before that though, Nori got kitted up in her winter gear! …and posed on the balcony of our hotel! Afterwards, we decided to take the car down to Thingvellir national park (where they filmed parts of Game of Thrones!). On the way we discovered this field of the most strange stones. People seemed to stack them into cute little piles, and what was weird is that the wild weather of Iceland hadn’t knocked them down. Nori decided that she wanted to make her own rock pile as well. However it got too wet afterwards as the skies decided to dump 50mm of rain on us haha! Nori managed to take a photo just before the rains hit too bad. Iceland is just… stunning. I will update soon with some more photos of Nora the Explorer. ooh she’s so appropriately dressed! The fur trim on the hood is so cute! Also, was it hard to get her hand to stay up with the pebble in it? I haven’t tried putting objects in my blythe’s hands, but I feel like any amount of weight would cause Finley’s arm to droop.